What does that mean? Back Up. It means saving your data in more than one place to ensure its protection against computer malfunction and deletion. This can be your treasured family photos, your holiday videos, your all-important presentation for that big meeting on Monday. Anything. Anything that you have made or saved onto a hard-drive. That is your data. Some data can be meaningless and unimportant such as a quick save of a funny image from google to send to a colleague for a quick laugh. But the majority of data on our computers is important. The scary fact is more than 30% of people have never backed up their data before and that puts them at risk. Let’s add to that.. 113 phones can be lost or stolen, globally, per minute, then that’s your fabulous selfies lost forever. Another fearful fact is that 1 in 10 computers will become infected with a virus per month and these viruses can alter, remove or infect data that can then not be transferred to other devices without risking spreading the virus. And then there’s just the occasional blunder of accidentally losing or deleting documents or photos that, let’s be honest, we’ve all done before. So here’s how to avoid these headaches. Where can you back up? Once upon a time the only way to back up your data was on several floppy disks, all with sticky labels to identify them. Nowadays however, there are many more and much more efficient methods. There is the simple memory stick for say an important document you want to transfer from computer A to computer B. This is a simple way to store data externally, and it is possible to get quite large memory sticks rather than the megabyte warrior of the past. However these are not long term solutions. They sell for as little as £5 and vary in size and style. They’re only really ideal for a quick fix or small file transfer. Memory sticks and memory cards can become encrypted or damaged or easily misplaced. They’re also rather outdated now because of this. There is also the option of an external hard-drive. These are often much larger and therefore can store much more data than a measly memory stick. These can be used for gaming storage, computer storage and are much more reliable than a memory stick. They’re also too big to lose easily but small enough to remain portable for business use or for someone who travels often. There is the issue of virus’ spreading in these devices as an encrypted file can then spread to other devices if connected to them. However they are much safer and more efficient than a memory stick. Next there is the option of 3rd party storage. This is a service we offer for customers and it is a guaranteed safe place to store your data. There is no limit and a small monthly fee for the protection costs, it’s easily accessible from several devices and takes the hassle out of your hands. This is perhaps the safest choice of back up as it involves someone to protect your data as part of their job. Just imagine a knight in shining armour standing in front of your most valued files, shield in hand. Finally there is the option of iCloud (Apple) or One Drive (Microsoft) online storage. This backs up your data similarly to a 3rd party storage system. It remains on your computer, but should the computer fail or you purchase a new one, Cloud storage allows easy access and transference of all your files. There is often, similarly to 3rd party storage, a small monthly fee or an installation process (such as Office 365 for One Drive) however this takes the worry of files becoming encrypted or losing the drive. That being said occasionally backups can fail and so you will need to occasionally check when the last back up was. We can offer 3rd party storage for anyone who feels they are forgetful or would just like the security of knowing it’s handled and hassle free. There is just a small monthly fee dependant on how much data you require storing. We also offer installation of Office 365 to keep all of your devices connected wherever you are. This comes at a single price for instalment and is therefore easier for those who prefer a one of annual payment. We also can provide a data recovery service for anyone who has been victim to a hack or has accidentally deleted some files. Anything you need retrieving we can find it. From there we can offer you advice and support on how to avoid this happening in the future and how to take care of your data so this doesn’t happen again. 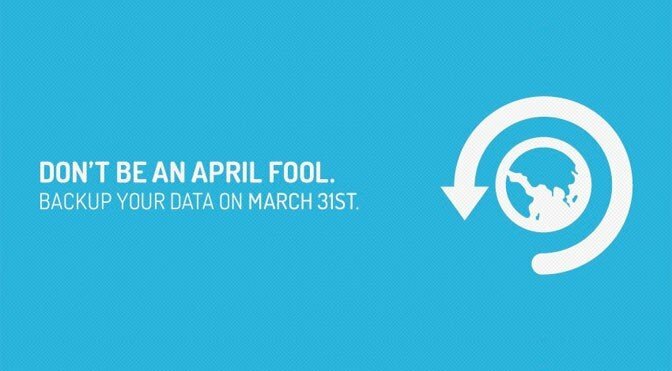 World Back-Up Day falls on March 31st 2017. It is known as the day for global back up and protection of digital files. So if you do not have a backup system in place, or do not feel confident with the one you have, drop us an enquiry or a call to find out how we can help you.